Almost every day I hear from someone who says they are afraid of failing again. 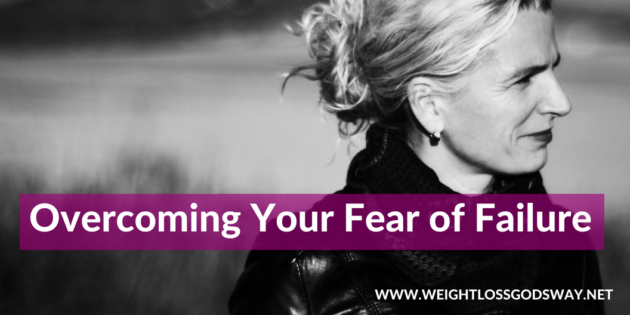 It’s understandable to get frustrated on the journey, but there are many things you can do to help you overcome your fear of failing so you can start succeeding at achieving your healthy weight. Fear of failure has negative consequences on your success. People who have a fear of failure are so worried about failing that they often stop trying or give up just before they’re about to reach their goal. They don’t realize that failing is what creates the stepping stones for our greatest success. We would never question that in order for a piano player to excel in his craft, it would require many hours of practice. The same goes for any athlete or artist. Yet, we often don’t realize that the same rules apply to our weight loss journey. It’s the principle of ‘failing forward’ otherwise known as ‘practice’ and it’s necessary in order to lose weight and transform your habits. Think about a baby learning to walk. You would never call them a failure every time they fell down, would you? What about a world-class figure skater preparing for the Olympics? So the same principle applies to losing weight. Everything you’ve learned in life has come through failing at first and then learning from your mistakes. Unfortunately, many of us let our fear of failing keep us from achieving our goals. When you don’t succeed, you say, “I’m a failure,” rather than “I failed at this and now it’s time to course-correct”. The thought of failure can be debilitating and may be preventing you from taking action. You’re afraid to start a diet because you don’t think that you will be able to succeed. You hold on to ‘fat-clothes’ in case you gain the weight back. You may spend a lot of time researching health and fitness related materials but never take action. You may make a lot of excuses about why you can’t lose weight when deep down inside it’s really fear. See Every Set-Back as a Set-up for a Comeback! See failure as a learning opportunity--nothing more, nothing less. It does not mean you're a failure and it does not mean that you will fail again in the future if you choose to see the lesson in every failure. Sometimes God needs us to understand failure before He can bring about success with us. Just imagine what would happen if you woke up tomorrow at your ideal weight? Would you change your habits? Would you learn how to take care of yourself? Would you learn how to love yourself; trust God or learn patient endurance? So, if you don't release weight one week (or 2 or 3), instead of quitting, use it as an opportunity to learn what you need to adjust for the coming week. Did you consume too much sodium? Did you eat too much? Did you eat too late at night? Were you too busy to exercise? If so, how can you adjust your schedule? Don't just say, 'Oh well, there's always next week--commit to doing better. Every time you 'back-slide,' seek forgiveness for dishonoring your body and let God know your desire to get healthy. Our guilt and condemnation can often weigh us down and make us feel like a failure. Isn't it interesting that when Jesus healed the paralyzed man, He did not comment on his ability to walk? His comment to him was, "your sins are forgiven." Jesus recognized the man's spiritual health was so important, and that's the gift that is the greater gift that Jesus gave the man. In faith, we must seek forgiveness for when we stumble. This will positively restore our body, soul, and spirit. It can be so easy to feel like a failure when you want to do one thing but keep doing the exact opposite! Despite our frustration, we must remain hopeful. The Bible has so much to say about hope (Romans 8:24, 1 Corinthians 13:13, Hebrews 11:1). Hope is confidence and certainty that God will fulfill every promise He has made. Hope is confident assurance. 2 Corinthians 3:12 teaches us that our relationship with Christ gives us such confidence that we can be very bold. How would you rate your level of hope? To stop your fear of failure from derailing your weight loss efforts, take some time and study scriptures on hope (Hebrews 11:1, 2; Corinthians 3:7-18). Too often we get so hung up on doing things just right that we miss all the little things that are making a big difference. We're only focused on the number on the scale and don't realize how much we're changing on the inside. We struggle with habits because we're focused on the outcome. Then we fall short of our expectations and get disappointed. Learning to keep practicing will require a shift in perspective. On your health journey, as well as other areas of our lives, shift your focus to the process instead of being attached to the outcome. In Philippians, Paul writes to the Philippian church and teaches them about the power of practice. He says, "What you have learned and received and heard and seen in me—practice these things, and the God of peace will be with you." Ask yourself, "What is truly keeping me from achieving my weight loss goals?" You might be surprised that it's a fear of failure. If so, let God know your fears and ask Him for guidance. Our Healthy by Design Program is designed to help you overcome your fears so that you can start losing weight, God's way. Learn more here: Weight Loss, God's Way. As Satan tries to put negative thoughts in my mind about re-gaining weight, I will continue to trust in God and put my faith in Him for my life long healthy journey.